Claire Santry goes on a weekend whale watching course in County Cork and learns about the fascinating work being done by the Irish Whale & Dolphin Group to observe and protect cetaceans in the waters around Ireland. Humpbacks pass the coast of Ireland on their way to their northern feeding grounds. It's impossible to predict your reaction to first spotting a whale in the open sea. Some people spontaneously whoop. Some screech. Others quietly exhale an awestruck "Wow". I just sat there, speechless, and my toes tingled. Indeed, it was several minutes after the minke whale had dived back into the deep that I realised the tingled sensation had travelled up from my feet to (mercifully) cure my backside of numbness. Being struck dumb is not an uncommon reaction. As for having a numb bum  after sitting for two hours on a breezy clifftop peering out over the Atlantic, on that matter I was definitely with the majority. What seems universal, however, is an inability to stop grinning. Everyone in my group of whale watchers spent most of the weekend with a rather smug, slightly daft grin on their face. activity and aids conservation efforts. Perhaps an element of the smugness was knowing that we hadn't had to fork out a fortune or fly halfway round the world in cattle class to savour the experience of watching minke whales, killer whales, common dolphins and harbour porpoises. Instead, we had travelled a mere 45 minutes from Baltimore, Co. Cork, across the delightfully named Roaringwater Bay to Cape Clear Island. We were a group of 20 or so adults (children aren't actively encouraged) from all walks of life and from all over Ireland, with a couple of Germans and Brits thrown into the mix. Nearly all of us were novices, and a few admitted to being sceptical about the likelihood of seeing any whales. After all, this was Ireland, wasn't it? The only things that seemed to unite us were an enthusiasm for wildlife and a sense of excitement as we approached Cape Clear's tiny North Harbour on Friday afternoon. A few admitted to being sceptical about the likelihood of seeing any whales. After all, this was Ireland, wasn't it? Within only an hour of disembarking from the small ferry, we met up with Padraig Whooley, the secretary of the Irish Whale and Dolphin Group (IWDG), who run the weekend courses. Most of us took up his invitation to join a casual afternoon watch on Pointe Bullig, the eastern headland of South Harbour. Our 30-minute hike up the steep paths was soon rewarded when we saw two killer whales – an adult and a female, according to Padraig – travelling towards the Fastnet Rock, some three miles southwest. For more than 30 minutes we could see them, leaping out of the sea and slapping their tails against the water. It was an extraordinary first sighting of whales and I felt privileged to have witnessed it. All this before the official itinerary began! Hovering or diving gannets frequently reveal feeding porpoises or dolphins. Mixed flocks of gulls, auks and kittiwakes may mean that a minke whale is working fish to the surface. Peculiar-looking vapour plumes hanging on the horizon in windless conditions will reveal the presence of whales. Keep watching, as they must resurface to breathe. Surface splashes or ill-fitting waves deserve a second look, as they may be caused by dolphins on the move. Lines or circular 'footprint' patterns on the water are a sign of animals having recently dived. A glint or sudden reflection on a sunny day is often caused by sunlight catching the water as it runs off the back of a surfaced cetacean. Within only an hour of disembarking from the small ferry, we met up with Padraig Whooley, the secretary of the Irish Whale and Dolphin Group (IWDG) who runs the weekend courses. Most of us took up his invitation to join a casual afternoon watch on Pointe Bullig, the eastern headland of South Harbour. Our 30-minute hike up the steep paths was soon rewarded when we saw two killer whales  an adult and a female, according to Padraig  travelling towards the Fastnet Rock, some three miles southwest. For more than 30 minutes we could see them, leaping out of the sea and slapping their tails against the water. It was an extraordinary first sighting of whales and I felt privileged to have witnessed it. All this before the official itinerary began! That evening the full group met in the Bunny Club where Padraig handed out resource packs and gave an illustrated talk on the 24 species of whale and dolphin (collectively known as cetaceans) in Irish waters. This is where we learned that the creatures some of us had seen earlier in the day were not whales. They may be called killer whales, but they are in fact the largest of the dolphin family. We also learned some terminology  leaping from the water is called 'breaching', tail slapping is 'fluke slapping'  and the tell-tale sign that help watchers locate cetaceans in a vast seascape. 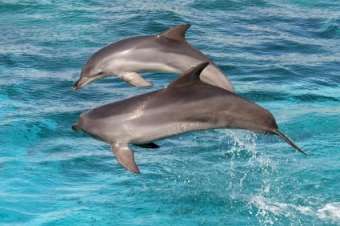 One snippet of information that really took me by surprise was that in 1991, Ireland became the first country in Europe to declare its waters a whale and dolphin sanctuary. Our education continued in the morning with Padraig giving a short slide presentation on species identification, and then we were off  once again wending our way up the island's steep paths to another vantage spot. Having adopted the usual bottom-numbing position, we stared out to sea through binoculars and other optical aids, searching for bird behaviour that might lead us to cetaceans. It was more than an hour before a cry went up: "Whale!" Twenty-odd pairs of binoculars shifted direction. There, feeding in the Sound between Cape Clear and Sherkin Island, was a whale. "What is it?" quizzed Padraig of his class. "A minke," called an unidentified voice. "Because it's far too big for a dolphin and I can't see a blow." "Correct," said Padraig, obviously pleased with his pupils. Within the next half an hour we spotted two more minkes and a number of harbour porpoises. The next watch, after lunch, produced more minkes. This time, they were closer to us, which was just as well because both weather and visibility were deteriorating. Since we were all hardy souls prepared for the occasional shower, this didn't dampen our enthusiasm and we eagerly agreed to the whale watching boat trip later that afternoon. Nonetheless, there were other highlights of the trip: the view of Cape Clear's South Harbour with its wildflower-covered hills, overtaking an ocean sunfish (a peculiar-looking creature that dawdles along as if it didn't have a care in the world) and watching countless Storm Petrels flying overhead. Back on dry land, the group met up after dinner for a slide show of a recent expedition by the Irish Whale and Dolphin Group to Mexico in search of the Blue Whale. Later, we decided to check out the island's weekly traditional music session which was held in the social club near the port. Great craic. Those who were fit and able in the morning (which wasn't everyone!) made their way to Pointe Bullig for the final watch. Visibility was poor and a light rain was blowing in at an angle. Despite our willingness to endure the conditions, we were rewarded with just two brief sightings of harbour porpoises. Fair weather or foul, there is no guarantee of either whales or dolphins showing up just because a group of well-wishers has arrived. Padraig told us that there had been a lot of cretacean activity in April, May and early June with minkes, Risso's dolphins and killer whales regularly seen by birdwatchers on the island. He had thought it would be a bumper year for whale watching. 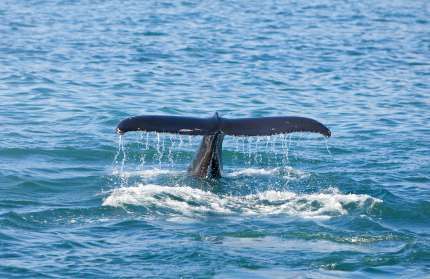 But the first group of course participants, in July, had not seen a single whale. That, he says, is very unusual, but so, too, was a weekend the previous year when his trainee whale watchers had been treated to sightings of seven species. "There is just no way of knowing where they are and when," he explained. He told us of a day the previous winter when he had completed a 90-minute watch along the Cork coastline and seen nothing, not even a harbour porpoise. On that same day, only 80 miles to the east, in Muggorts Harbour, his colleague had recorded minke whales, humpback whales, fin whales (the second largest creature on the earth after the Blue Whale), Risso's dolphins, common dolphins and harbour porpoises in just one land-based watch. "Six species in one watch! In Ireland!" Padraig could hardly contain himself. "Admittedly, that's not a typical watch; only once or twice a year will you get to see a selection like that. "But you can go to British Columbia, Patagonia or New Zealand – the supposed best places in the world for watching cretaceans – and in 90 minutes you might see only two species. This shows the potential we have in Ireland for a whale-watching industry. However, if we are exposing Ireland as a whale-watching hotspot, it will need careful management." Such developments seemed some way off as the ferry chuged away from Cape Clear's North Harbour and another group of grinning whale watchers returned to the mainland, full of new knowledge and wonderful memories... and, yes, still a little numb. 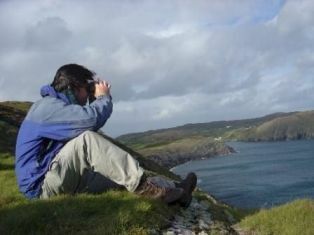 For dates and details of whale watching courses on Cape Clear, visit IWDG's website. 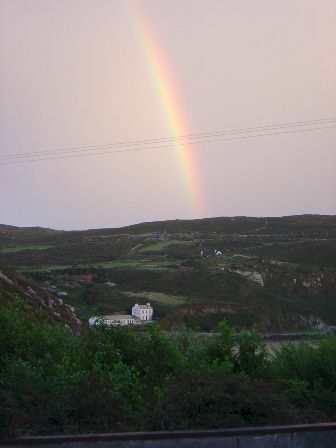 This feature was first published in Failte Welcome magazine in 2005.